Is FirstGiving right for your organization? FirstGiving's peer-to-peer fundraising tools allow you to easily manage your fundraising campaigns, grassroots campaigns, donor communications, and much more! 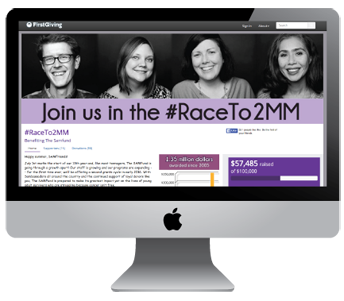 Bring the look and feel of your website right to FirstGiving and empower your supporters to create their own fundraising pages. Create your own "countdown" donation form for a special project or day of the year. Allow your donors to search the HEPData corporate gift matching database and discover if their employer will match their donation. Customize automated thank you emails from both the nonprofit and the individual fundraiser. Manage events, registration data, donations, and communications in one place with exportable reports. Embed your "Donate Now" button, leaderboard, total raised, and event registration widgets anywhere you like. Easily import your fundraising data into GiftWorks donor management software and start building personal and lasting relationships with your donors.